Hanwell Community Observatory is located in the village of Hanwell, near Banbury (North Oxfordshire, UK). Exit M40 at junction 11. Following the signs for Banbury, go straight over the first two roundabouts. At the third roundabout turn right onto the A423. After 1.75 miles, turn left for Hanwell. Click here for a map of Hanwell village or click here to find us on Google Maps. For sat-nav users, the postcode is OX17 1HN. Please note that for events such as Stars & Snowdrops there is no general public parking on the site, only limited parking for those needing disabled access. 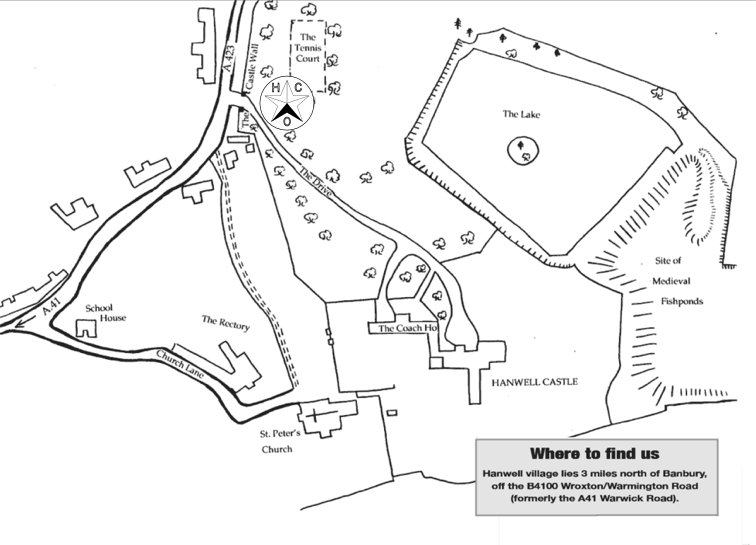 We ask all visitors to please park outside the castle grounds and in the village itself. Important HCO post has gone missing recently because of being sent to the Google Maps address - please do not use it.